Plot: A group of journalists covering George Bush's planned invasion of Iraq in 2003 are skeptical of the presidents claim that Saddam Hussein has "weapons of mass destruction." Starring: Jessica Biel, Woody Harrelson, Milla Jovovich, Tommy Lee Jones. 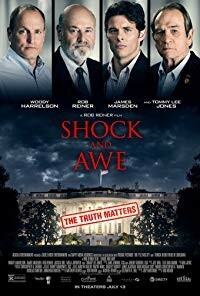 distributed by Vertical Entertainment «Shock and Awe» in the US movie theaters released on July 13, 2018 and has grossed over $78k worldwide; dvd and blu-ray release date was set for August 14, 2018. Rent from Netflix and Redbox from August 14, 2018. «Shock and Awe» in the UK released in movie theaters on September 10, 2018. The movie released on dvd and blu-ray on September 10, 2018.